Clin Cancer Res. 2018 Apr 23. pii: clincanres.3060.2017. doi: 10.1158/1078-0432.CCR-17-3060. Caumanns JJ, Berns K, Wisman GBA, Fehrmann RSN, Tomar T, Klip H, Meersma GJ, Hijmans EM, Gennissen A, Duiker EW, Weening D, Itamochi H, Kluin RJ, Reyners AKL, Birrer MJ, Salvesen HB, Vergote I, Van Nieuwenhuysen E, Brenton JD, Braicu EI, Kupryjanczyk J, Spiewankiewicz B, Mittempergher L, Bernards R, van der Zee AGJ, de Jong S.
Advanced stage ovarian clear cell carcinoma (OCCC) is unresponsive to conventional platinum-based chemotherapy. 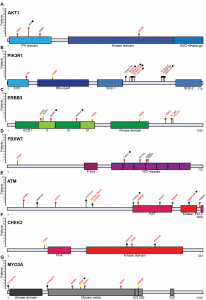 Frequent alterations in OCCC include deleterious mutations in the tumor suppressor ARID1A and activating mutations in the PI3K subunit PIK3CA. In this study, we aimed to identify currently unknown mutated kinases in OCCC patients and test druggability of downstream affected pathways in OCCC models. In a large set of OCCC patients (n=124), the human kinome (518 kinases) and additional cancer related genes were sequenced and copy number alterations were determined. Genetically characterized OCCC cell lines (n=17) and OCCC patient-derived xenografts (n=3) were used for drug testing of ERBB tyrosine kinase inhibitors erlotinib and lapatinib, the PARP inhibitor olaparib and the mTORC1/2 inhibitor AZD8055. We identified several putative driver mutations in kinases at low frequency that were not previously annotated in OCCC. Combining mutations and copy number alterations, 91% of all tumors are affected in the PI3K/AKT/mTOR pathway, the MAPK pathway or the ERBB family of receptor tyrosine kinases and 82% in the DNA repair pathway. Strong p-S6 staining in OCCC patients suggests high mTORC1/2 activity. We consistently found that the majority of OCCC cell lines are especially sensitive to mTORC1/2 inhibition by AZD8055 and not towards drugs targeting ERBB family of receptor tyrosine kinases or DNA repair signaling. We subsequently demonstrated the efficacy of mTORC1/2 inhibition in all our unique OCCC patient-derived xenograft models. These results propose mTORC1/2 inhibition as an effective treatment strategy in OCCC. April 26, 2018 in Publications, Science.